OK folks, here’s what’s shakin’. We got to town mid-day Monday, and spent the day wandering around the French Quarter having fun. Today, Tuesday, we had our first day of work. We went to a house in the Upper 9th Ward, and had our introduction and safety talk by Pete, a full-time Habitat for the Humanities employee. He told us about how the ownership of the houses work, the sweat equity that the owners put in, and the fact that there is this rolling mortgage fund which, as owners pay their interest-free mortgages, rolls over to finance new homes. Cool. 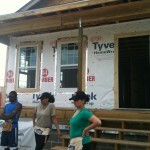 Then, with some instruction, we began our first task- putting the siding on the front of a new home. The siding consists of 6” boards made out of a composition material- cement and sawdust blended together and molded to look exactly like wood. After carefully chalking a line on the bottom, we worked our way up the front of the house, using hammers and roofing nails. A couple of volunteers from Michigan- Rich and his wife Jane- manned the circular saw and cut pieces for us as we called out the measurements. And on it went! Lunch came, a superb repast by all accounts, and then back to work. Finally, the siding was up! Then, new tasks. 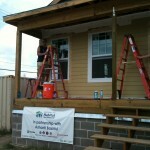 Some of the us put small strips of siding up high on the house, others caulked the siding we had just done. Then we started another job- putting OSB (that’s oriented strand board) on the underhang of the porch roof. Then… time to go! Definitely cool.